Johnnie B. "Dusty" Baker Jr. (born June 15, 1949) is an American Major League Baseball manager and a former player. He is currently the manager for the Washington Nationals. He enjoyed a 19-year career as a hard-hitting outfielder, primarily with the Atlanta Braves and Los Angeles Dodgers. He helped the Dodgers to pennants in 1977 and 1978 and to the World Series championship in 1981. He then enjoyed a 20-year career as a manager with the San Francisco Giants, Chicago Cubs, Cincinnati Reds, and now the Washington Nationals. He led the Giants to the 2002 National League pennant and also reached the playoffs with the latter three teams. Baker was drafted by the Atlanta Braves in the 1967 amateur draft out of Del Campo High School near Sacramento, California. Baker was inducted into the Sac-Joaquin Section's Hall of Fame class in 2010 for his play at Del Campo. He began his major league baseball career as an outfielder for the Braves in 1968. As a Brave, he earned a spot as a footnote in history. On April 8, 1974, he was on deck when Hank Aaron hit home run 715 to pass Babe Ruth in career home runs. A few of Baker's accomplishments as a player include playing for the National League All-Star team in 1981 and 1982, and winning three League Championship series in 1977, 1978, and 1981. Baker ultimately won a World Series title in 1981 with the Dodgers. However, Baker played poorly during the series, batting .167 with an OBP of .192. After spending eight full seasons with the Braves and another eight with the Los Angeles Dodgers, as well as short tenures with both the San Francisco Giants and Oakland Athletics, Baker finished his career as a player with a .278 batting average, 242 home runs, and 1,013 runs batted in. He played his final season in 1986. Many believe that Baker played an integral part in the first ever high five, which occurred between Baker and Dodgers teammate Glenn Burke on October 2, 1977, at Dodger Stadium, a story featured in the ESPN 30 for 30 documentary "The High Five" directed by Michael Jacobs. It was the last day of the regular season, and Dodgers leftfielder Dusty Baker had just gone deep off the Astros' J. R. Richard. It was Baker's 30th home run, making the Dodgers the first team in history to have four sluggers – Baker, Ron Cey, Steve Garvey, and Reggie Smith – with at least 30 homers each. It was a wild, triumphant moment and a good omen as the Dodgers headed to the playoffs. Burke, waiting on deck, thrust his hand enthusiastically over his head to greet his friend at the plate. Baker, not knowing what to do, smacked it. "His hand was up in the air, and he was arching way back", says Baker, now 62 and managing the Reds. "So I reached up and hit his hand. It seemed like the thing to do." He is noted for his love of toothpicks. He chews them every game and was once quoted saying, "Toothpicks are an excellent source of protein." Baker's coaching career started as a first base coach for the San Francisco Giants in 1988, and then he spent the following four years (1989–1992) as the hitting coach, and finally became the manager in 1993, replacing the departing Roger Craig. In his very first year as Giants manager, he won the NL Manager of the Year award, leading the team to a 103–59 record, which was the second-best record in baseball that year (behind the 104–58 Atlanta Braves), and 31 games better than their 72–90 finish the previous year. His Giants went on to win division titles in 1997 and again in 2000; Baker would win Manager of the Year honors in both of those years as well. It was during his San Francisco tenure that the term "Dustiny" was coined by former Giants pitcher Rod Beck. In 2002, his Giants gained the wild-card berth and from there advanced to the World Series, where they lost in seven games to the Anaheim Angels, who were managed by his former Dodger teammate, Mike Scioscia. Baker is infamously known for removing Russ Ortiz during Game 6 of the 2002 World Series despite Ortiz allowing only four hits. Many Giants fans credit Baker for causing the loss as the Angels came back and won that game 6–5. Despite Baker's success in San Francisco, he had an increasingly strained relationship with owner Peter Magowan, one that even the Giants' first pennant in 13 years couldn't mend. The Giants did not renew his contract after the season, letting him leave to manage the Chicago Cubs and hiring Felipe Alou to replace him. Baker finished his tenure with a record of 840 wins and 715 losses in the regular season and 11 wins and 13 losses in the post-season. 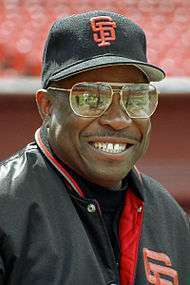 To date, Baker is one of only three African Americans to manage a World Series team. Cito Gaston (the only African American manager to win a World Series) was the first, managing the Toronto Blue Jays to the championship in 1992 and 1993. Baker was the second, and Ron Washington has since joined Gaston and Baker by managing the Texas Rangers to the 2010 and 2011 World Series. Baker also has the most wins as manager in the San Francisco portion of Giants history; only John McGraw won more games with the franchise. Baker meeting with Cecil Cooper of the Houston Astros prior to a 2006 matchup at Wrigley Field. Baker made a major impact with the Cubs in his first season as manager for the ball club. With the help of an impressive pitching staff and big gun batters such as Sammy Sosa and Moisés Alou, the Cubs were able to claim their first division title in 15 years. However, the Cubs’ hopes for winning a World Series title were cut short during the 2003 National League Championship Series against the Florida Marlins. The Marlins would go on to claim the 2003 World Series. In 2004, the team was involved in a heated wild card chase with the Houston Astros, but fell out of contention near the season's end. In the subsequent season, the Cubs lost several of their key players, most notably ace pitchers Mark Prior and Kerry Wood, to injuries. The team finished the season with a 79–83 record, marking the first time in three years that the Cubs finished with a losing record. The Cubs’ performance declined in the next season as they fell to 66–96 and finished last in the entire National League. A month after that season ended, the Cubs declined to renew Baker's contract. They allowed Baker to address the media in a press conference in early October, where he officially announced his departure. The Cubs turned to Lou Piniella to replace Baker for the 2007 Chicago Cubs season. Baker finished his tenure with a regular season record of 322 wins and 326 losses and a post-season record of six wins and six losses. Dusty Baker sporting his new Reds jersey at RedsFest 2007. On October 13, 2007, Baker was hired as manager of the Cincinnati Reds, replacing interim manager Pete Mackanin. Baker and the Reds finished 74-88 and 78-84 in 2008 and 2009, finishing 5th and 4th in the NL Central. In 2010, the Reds enjoyed success as one of baseball's breakout teams, and on September 28, 2010, the Reds won the Central title. This championship led to their first playoff appearance in 15 years. However, the appearance was short-lived as the Reds were swept by the Philadelphia Phillies in the NLDS. 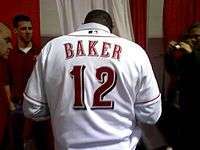 Baker signed a two-year contract extension with the Reds on October 4, 2010. During September 2012, Baker stayed in a Chicago hospital for treatment of an irregular heartbeat. Baker, 63, was hospitalized because of a longstanding heart problem. The Reds clinched the 2012 Central Division championship in his absence, their second in three years and Baker's fifth as a manager. On October 15, 2012, he signed a 2-year contract extension as manager of the Reds. On October 4, 2013, Baker was fired as manager of the Reds after a loss to the Pittsburgh Pirates in the National League Wild Card Game, their sixth straight loss dating to the end of the regular season. Baker finished his tenure with a regular season record of 509 wins and 463 losses and a post-season record of two wins and seven losses. On October 22, 2013, he was replaced by Reds pitching coach Bryan Price. On November 3, 2015, Baker was named the new manager for the Washington Nationals for the 2016 season, his first managerial position since being fired by Cincinnati in 2013. At the time of his hiring, he was the only black manager in Major League Baseball (now second with the Dodgers hiring of Dave Roberts) and has the second–highest total for most wins in MLB. The Nationals would win the NL East in Baker's first season, but lose in the NLDS against the Dodgers. Dusty Baker during his days with the Chicago Cubs. Baker, an old-school baseball traditionalist, was scrutinized for the Cubs’ declining productivity. Baker has said that putting men on base can be unimportant and merely "clogging up the bases." This position has made Baker a target among the sabermetric community. Additionally, many fans, commentators, and writers have blamed his tendency to overuse pitchers for damaging the careers of Robb Nen, Kerry Wood, Mark Prior, and Edinson Vólquez. Wood and Prior suffered serious arm injuries following their first full seasons under Baker. Wood and Prior averaged 122 and 126 pitches per start, respectively, in their final six regular-season starts of 2003. In later years, Baker's teams featured players throwing fewer pitches, and some baseball writers have noted there's no clear link between pitches thrown and injuries suffered. Baker is known as a "player's manager." He is seen as preferring to play veterans over prospects even when his teams are out of the playoff hunt, stating a need to maintain the integrity of the playoff races. In 2003, Baker was the subject of some controversy when he stated that "black and Hispanic players are better suited to playing in the sun and heat than white players." Baker, defending his beliefs, later said, "What I meant is that blacks and Latinos take the heat better than most whites, and whites take the cold better than most blacks and Latinos. That's it, pure and simple. Nothing deeper than that." Baker has never won the World Series as a manager. In 1998, the Giants finished the season tied for the Wild Card playoff position, but lost the National League Wild Card tiebreaker game to the Chicago Cubs. The 2002 postseason was the only time in his managerial career with the Giants that he won a postseason series. The 2003 NLDS with the Cubs was only his third series win, and he never got past the first round in any of his next four postseason appearances with the Reds or Nationals. Baker has presided over some of the biggest collapses in baseball history. In 1993, his Giants led the National League West by 9.5 games on August 7, but ended up losing the division to the Atlanta Braves and missing the postseason. The Giants lost 12-1 on the final day of the season when a win could have forced a tiebreaking game with Atlanta for the division championship. In 2002, the Giants led the World Series against the Anaheim Angels 3 games to 2. San Francisco had a 5-0 lead in the seventh inning of the sixth game, but allowed the Angels to score six unanswered runs in the seventh and eighth innings to win. The Angels also won Game 7 to win the championship. In 2003, Baker's Cubs led the National League Championship Series 3 games to 1 against the Florida Marlins. The Marlins stormed back to win the final three games of the series, including overcoming a 3-0 Chicago lead in the eighth inning of Game 6 (the game that featured the Steve Bartman incident). In 2012, Baker's Reds led the National League Division Series 2 games to 0 against the San Francisco Giants. With the final three games of the series at home in Cincinnati, the Reds needed to win just once to advance to the National League Championship Series, but the Giants completed the comeback by winning games 3, 4, and 5 and went on to win the World Series. The Reds also suffered a six-game losing streak to end the 2013 season, including a loss in the Wild Card game at Pittsburgh. Reds general manager Walt Jocketty admitted the team's latest collapse played a role in the decision to fire Baker. Baker served as an ESPN analyst during the 2006 MLB Postseason and served in a similar role during the 2007 season. In 2015, Baker joined TBS as a studio analyst for the final two weeks of their regular season coverage and for their coverage of the National League playoffs. Baker was a member of the United States Marine Corps Reserve from 1969 through 1975. Baker has a wife, Melissa, and two children named Natosha and Darren. Darren was famously rescued by J. T. Snow from being run over at home plate during the 2002 World Series. Baker and his family reside in Granite Bay, California. Near the end of the 2012 baseball season, Baker was hospitalized for both an irregular heart beat as well as a "mini-stroke." Baker is a member of the National Advisory Board for Positive Coaching Alliance, a national non-profit organization committed to providing student-athletes with a positive, character-building youth sports experience. Baker has appeared in several videos and webinars for this organization, all of which can be found on the group's YouTube channel. Dusty is also owner of Baker Family Wines, along with owner and winemaker Chik Brenneman. ↑ Joe Davidson. "Hometown Report: Father's lessons helped Baker aspire to greatness". The Sacramento Bee. Retrieved 2010-10-30. ↑ Jenkins, Bruce (September 22, 1997). "Season of 'Dustiny' In One Bizarre Play / Fly ball-turned-homer symbolizes Giants' magic". San Francisco Chronicle. ↑ Schulman, Henry (December 9, 2002). "Six weeks later, loss in Series still throbs / Pain of defeat stays with Giants". San Francisco Chronicle. ↑ Schulman, Henry (November 7, 2002). "TELL HIM GOODBYE / Giants drop Baker after his feud with owner". San Francisco Chronicle. 1 2 3 4 5 "Dusty Baker". baseball-reference.com. Retrieved 21 November 2014. ↑ "Reds give Dusty Baker a three-year deal". Los Angeles Times. Archived from the original on 2007-10-24. Retrieved 2007-10-14. 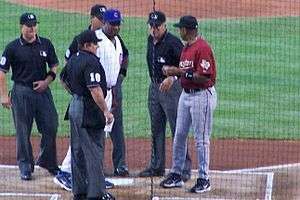 ↑ (2010-09-29) "Reds, Rays and Yanks Punch Playoff Tickets", CBS News. Retrieved 2010-09-29. ↑ Snyder, Matt (October 15, 2012). "Reds, Dusty Baker agree to two-year contract extension". CBSSports.com. Retrieved October 15, 2012. ↑ "Reds dismiss manager Dusty Baker". ESPN.com. October 4, 2013. Retrieved October 4, 2013. ↑ Sheldon, Mark (October 22, 2013). "Reds tab Price to be their new manager". MLB.com. 1 2 Friedrich, Howard (November 3, 2015). "Washington Nationals hire Dusty Baker as manager". Toronto Star. Associated Press. Retrieved November 3, 2015. ↑ "Notes: Cedeno reacquainted with short". Chicago Cubs. Retrieved 2015-11-03. 1 2 Sullivan, Jeff. "Dusty Baker Is Not a Bad Hire | FanGraphs Baseball". Fan Graphs. Retrieved 2015-11-03. ↑ Fay, John (2007-10-13). "Baker to manage Reds". The Cincinnati Enquirer. cincinnati.com. Retrieved 2010-06-06. ↑ Connolly, Marc (2001). "Spotlight: Dusty Baker". ABC Sports Online. Retrieved 2010-06-06. ↑ Perrotto, John (2009-03-11). "On the Beat: Spring Dust-up". Baseball Prospectus. Retrieved 2010-06-06. ↑ Johnson, Chuck (July 8, 2003). "Baker stands by heat comments". USA Today. Retrieved May 1, 2010. ↑ Gonzales, Mark (January 25, 2007). "Baker's ESPN job has out for managing". Chicago Tribune. ↑ Gough, Paul J. (February 14, 2007). "ESPN signs Baker for baseball". The Hollywood Reporter. ↑ Bucholtz, Andrew (September 17, 2015). "AA Q&A: NEW MLB ON TBS ANALYST DUSTY BAKER TALKS RETURN TO TV, BASEBALL'S CHANGES, AND MORE". Awful Announcing. ↑ "Baker's son gets unexpected ride from home plate". USA Today. 2002-10-25. Retrieved 2007-06-27. ↑ McCauley, Janie (March 25, 2014). "Dusty Baker out of baseball, into the garden". Cincinnati.com. Associated Press. ↑ "ESPN: Reds' Dusty Baker suffered stroke". ESPN.com. September 26, 2012. ↑ "About Baker Family Wines". Retrieved 29 September 2016. Wikimedia Commons has media related to Dusty Baker.